"Point Park University is truly the school that allows their students to shine if they take part in the opportunities provided on campus. 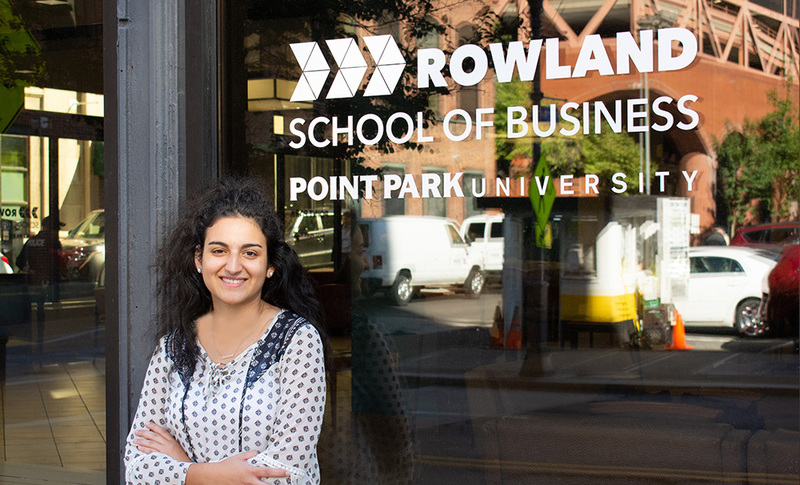 That was something I noticed right away when I first toured campus, and I am very glad I chose Point Park." Tell us about being selected for the First National Bank Mentoring Young Leaders Program. I was recommended by Information Technology Professor Mark Voortman for First National Bank's mentoring program. The program is in its first year and is a partnership between the Rowland School of Business and First National Bank. It partners five undergrads (freshmen and sophomores) with a First National Bank executive mentor. This program allows us to make connections by meeting with our mentors, learning about the financial industry, and being introduced to other departments and contacts. As a freshman, I am very grateful I was selected, and know that this will benefit my future and be a valuable experience. My mentor is Ms. Linda Leonhardt, who oversees FNB's branches and is a senior vice president. Even though I am not a finance major, I am getting to further understand how FNB uses data science in order to acquire new bank clients. Data science is a huge industry to get into right now and being able to see it applied in banking is very vital to my education. I am a Pittsburgh native, and knew that I wanted to continue to grow my roots by going to college in my favorite city. The city setting provides a vast amount of opportunities for students whether that be with jobs, entertainment, food and much more. As a Point Park student, I have been able to grow a much higher appreciation for my city and experience it in a whole new way. It was important to me that I would be able to commute to college, so the commuter resources on campus (lockers, lounges and many other accomodations) really stood out to me compared to other surrounding colleges. Also, a few of my family members are Point Park alumni so that makes me proud to be a student and share that with them. Also, another major factor for me coming to Point Park was the IT program. It is very unique compared to other colleges since it is in the School of Business, allowing you to get a background in business while still pursuing a degree focused in information technology and data science. This combination will allow me to be a stronger candidate due to how the program is designed. How have our faculty and classes impacted you so far? I have always been very goal oriented and enjoy having a full work load, but I realized that I sometimes lose focus on what is important to me by participating in activities that I may not be fully benefitting from. I want to be successful with everything I pursue, and with that, I have learned from faculty that I need to focus more on what I am truly passionate about. I've learned that when you figure out what really motivates you, then you will start to engage more in the classes, internships, organizations and opportunities that will enrich, benefit and push you towards your goals. I am currently vice president of the Information Technology Student Organization (ITSO) on campus. Being a female who is interested in tech has always left me underrepresented, but this organization makes me feel very welcome since it allows everyone to grow within our program. We work on many hands-on projects that let us apply what we learn in class. By taking on an officer position, I am able to help grow the organization in order to benefit our members with their career goals. I can’t wait for what is in store for the IT program, our professors and ITSO. The most important thing that people should know about me is that I am very future oriented, and I always think about what I can do now in order to reach my goal that may be YEARS down the road. I know that I want to become a data scientist, or work with data of some kind. I am passionate about data science, and also love anything to do with business. I am currently trying to form a Point Park or collegiate Data Jam for our student body. The job market currently is in NEED of data scientists so I want to educate our students on data science, and how it can benefit them in their future career paths no matter what major they are. I knew from an early age, that I would someday have my own company. I am very self-motivated and try to meet the correct people in order to get me closer to that goal. Along with careers, I enjoy volunteering and community service, and envision myself starting up some kind of nonprofit that empowers girls and women, or even just something as simple as a scholarship fund to assist students. I never stop thinking of what I can be doing next in order to better myself and benefit others. Point Park University is truly the school that allows their students to shine if they take part in the opportunities provided on campus. That was something I noticed right away when I first toured campus, and I am very glad I chose Point Park. Another thing about Point Park that stands out are the faculty, and how they care about the success of their students. The campus always has some type of activity going on, and as a commuter student I always make sure to stay longer (I basically live on campus) just so I can be with friends or take part in the festivities. Point Park's students are not just another number. The University offers many different events that attract all types of students. My biggest advice would be to get involved on campus and to explore the city. This University offers so much for their students, and I guarantee that if you get involved, you will succeed at Point Park.